We don’t have family nearby, so we spend the day with friends. This year, we spend the day with our best man, Luke. He and his family were gracious enough to let us join them for the day. We arrived early — at about 1pm. Plenty of time for us to help out with the cooking and general prep. The family always makes two birds: one fried, one baked. 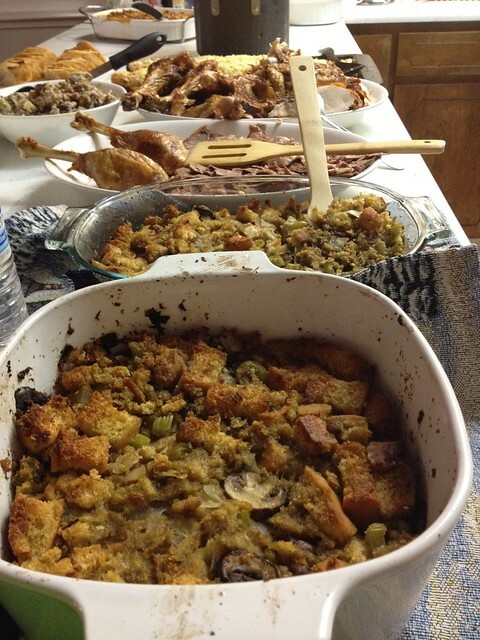 This year, it was fried turkey and baked goose. 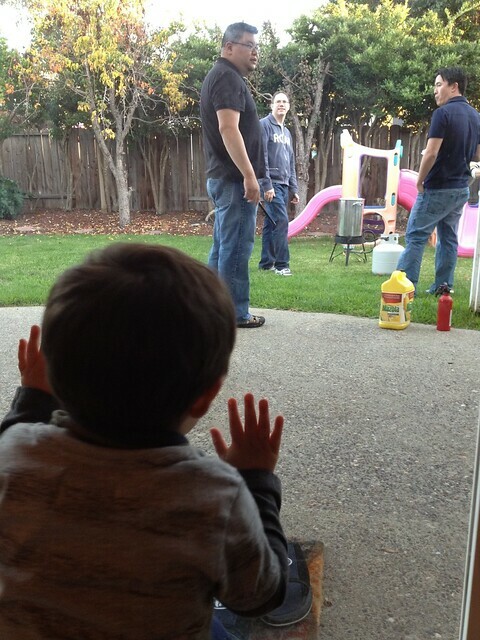 Lil’ Man really wanted to be join the big boys outside as they fried up the turkey, but I think we’ll wait until he’s a LOT older. We also watched a bit of football, as is also traditional. 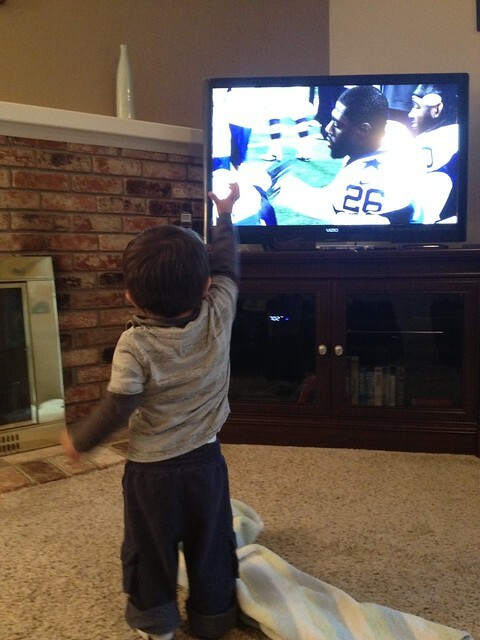 Lil’Man didn’t like it quite so much as Elmo, but he did cheer for Dallas and Houston. There’s a little bit of Texan in that boy after all! Finally, it was time to eat. The spread wasn’t very pretty, but it was darn tasty. Turkey, goose, stuffing, green bean casserole, yams, mashed potatoes, cranberry-raspberry delight, rice with veggies and sausage and gravy over everything (at least it was on my plate). All topped off with apple and pumpkin pie. As my contribution to the dinner effort, I slightly tweaked Martha’s Hot Spinach Dip. It was a great appetizer for people to munch on while they sipped on wine and cooked the real food. It was delicious and very well recieved. Plus, it’s totally easy to make, so I highly recommend it. Sadly , I didn’t take any photos of the dish or its prep, but it looked just like the spinach dips you get at restaurants, only better. Add half the spinach and let it wilt before adding the second half; cook until completely wilted, 5 to 8 minutes. Transfer to a colander; drain, pressing to release all excess liquid. You can make this veggie mix up to three days in advance, cover and refrigerate. In the same pot, warm milk over high heat. Whisk in cream cheese until melted, about 3 minutes. Add spinach, Worcestershire sauce, paprika and 1/2 cup mozzarella; stir to combine. Season with salt and pepper. Pour into a lightly oiled 1 1/2-quart shallow baking dish; sprinkle with remaining mozzarella. Bake until bubbly and golden brown, 20 to 25 minutes. Serve hot with baguette slices, crackers, breadsticks, pretzels, or whatever else you feel like using to transfer this cheesy goodness to your tastebuds.